On Wednesday, October 8th, a Student Government open forum was held in a foreign language classroom to discuss the implementation of the proposed 7+H schedule with the student body. In attendance were the members of Student Government, Dr. Lord, Mr. Shea, and about 20-25 Andover High students. Jason Grosz, who is the chair of the bureau of policy and student liaison to the school committee, was surprised with the high attendance at the open forum. 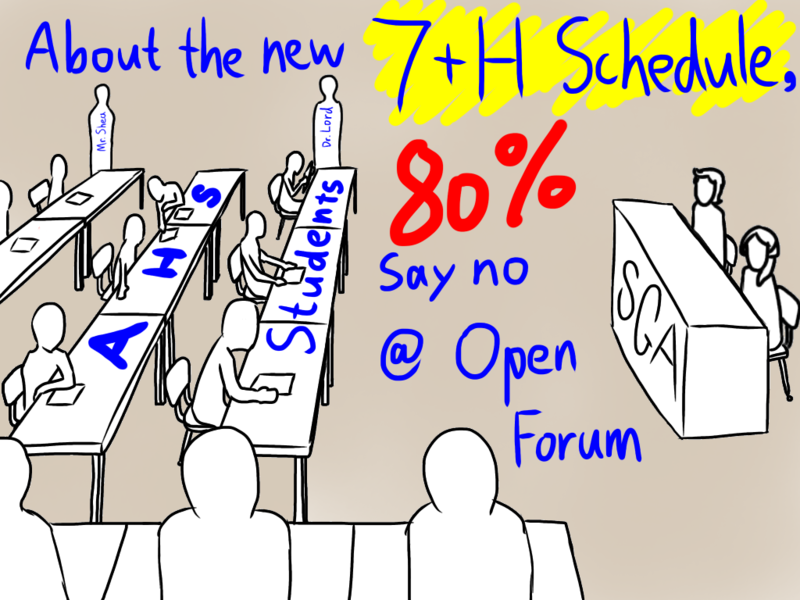 However, at the open forum, the majority of the students viewed the proposed new schedule in a negative light. Grosz stated that a good number of students were unclear as to what exactly the new schedule was all about. This was evident at the open forum, and was also seen through the student survey, which was posted on the Warrior Weekly. The new schedule is a rotating 8-day schedule that constitutes five blocks in total per day, including an advisory period called the H-Block. In 2012, NEASC visited Andover High School and recommended that a student personalization program be implemented. As a result of this, the AHS scheduling committee got to work and proposed a new schedule that would include teacher collaboration time during school hours. Also, the scheduling committee emphasized course continuity in the new schedule. Courses would be taken all year; for example, a long gap without taking math or foreign language would no longer exist. Despite these potential positive impacts, the majority of the students at the forum did not support the new schedule. According to the survey, around 80% of the students were against incorporating the proposed schedule. Andrew Silvestro was one junior who spoke out confidently against the new schedule at the open forum. Silvestro was not only passionate with his beliefs, but he was knowledgeable on the subject. Ultimately, it will be up to the school committee and the teachers’ union, not the students, to decide whether or not the new schedule will be implemented.